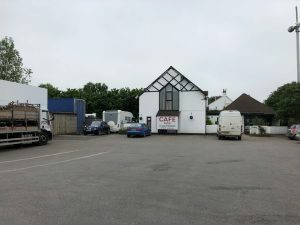 The Nunney Catch café is a real old school, traditional truckstop near the town of Frome on the roundabout where the A359 road from Bruton joins the A361 Shepton Mallet to Trowbridge main road at Nunney in Somerset, close to the small City of Wells. It’s in the heart of the Mendips, which means its popular with trucks serving the quarries of Merehead and Whatley. 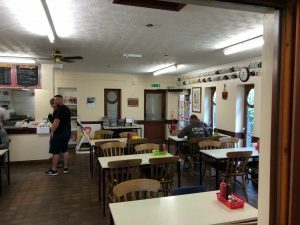 It’s a small establishment – the dining area seats about 40 people at any one time – and accordingly it offers a good enough range of food, but not as extensive as other cafés. This is a popular place for truck drivers seeking a good breakfast to start their day and seems to be well liked by locals in the area as well. 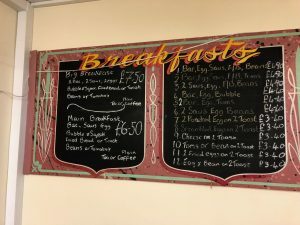 The Big Breakfast is £7.50 and has two rashers of bacon, two sausages, two eggs, bubble & squeak, fried bread or toast, beans or tomatoes and comes with a mug of tea or coffee. For a pound less is the slightly smaller Main Breakfast and this one rasher of bacon, a single sausage, eggs, bubble & squeak, fried bread or toast, beans or tomatoes and also comes with a mug of tea or coffee. There are also several smaller breakfast offerings. For £4.90 you can have bacon, sausage, egg, fried bread and beans or tomatoes or two sausages, eggs, fried bread and beans. At £4.40 are bacon, eggs and bubble & squeak or two bacon, eggs, tomatoes or two sausages with eggs and beans. At £3.40 are a variety of options on toast, including, two poached, scrambled or fried eggs, cheese, tomatoes or beans or egg and beans on toast. A mug of tea is a pound and coffee is £1.40. There are snacks and drinks also available for take away. There is a basic range of light meals including toasties such as bacon or sausage at £3.20 or a cheese and ham toastie at £4. A plain jacket potato is £3 while soup with a roll is £2.95. A round of toast is 50p, or with marmalade or jam, then it’s just 60p. The Nunney Catch café also offers 10 inch baguettes – which can be ordered with just one filling at £3.40, two items at £4.60, three items at £5.60 and four at £6.40. the choice of fillings include sausage, eggs, bacon, mushrooms and tomatoes. There is a large mixed grill for £6.95 which comes with bacon, egg, beef burger, chips, peas, beans and tomatoes while the small mixed grille is £5.95 and includes all the above apart from the burger. Other main meals include gammon, egg, chips and peas at £6.95, steak & kidney pudding, with chips and peas also at £6.95. Chicken curry, served with a choice of either rice or chips, is £6.50, as is chilli con carne – again with the choice of either rice or chips. A beef burger in a bun, with onions and relish, is priced at £3 while a cheese burger with the same accompaniments is £3.60. A vegetarian burger or sausages with egg, chips and peas is priced at £5.95. The site is open on Mondays to Thursdays from 0700-1930 while Fridays sees it open again at 0700 but close slightly earlier at 1730. Saturday opening hours are 0730-1300. 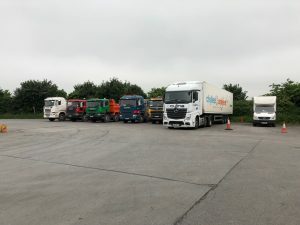 Overnight parking £10 and there is room for about 30 trucks. 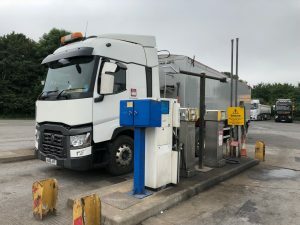 There are also showers and toilets available for drivers 24/7 and the site also sells fuel and gas oil. Drivers need to note the parking is not secure or monitored. However the general consensus of this café seems to be that the food is good and value for money.